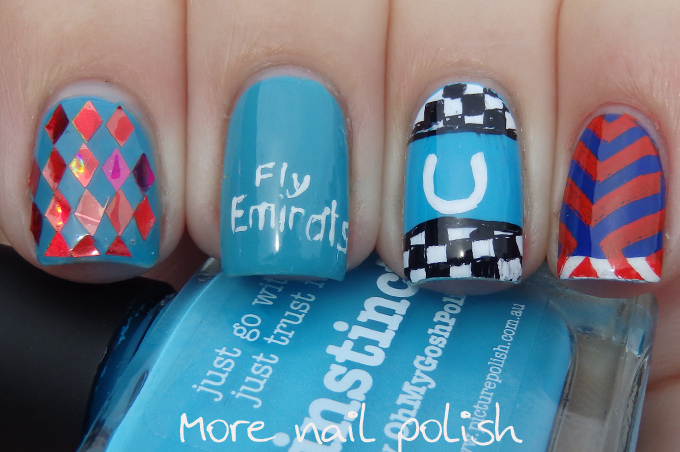 Does anyone remember what happened with my nails for Melbourne Cup Day last year? 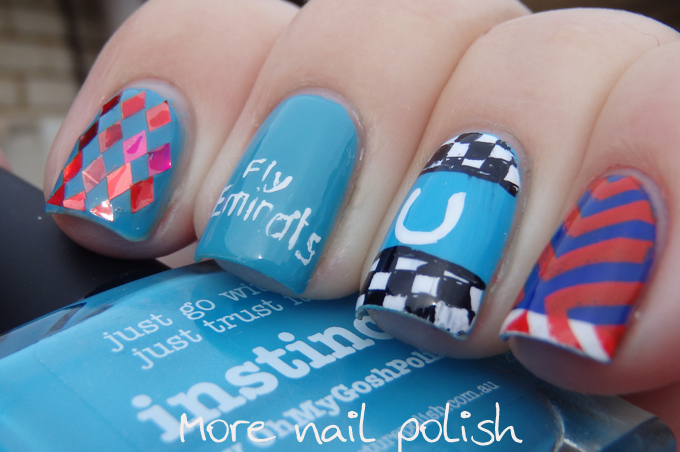 Just to recap, I went through the cup guide the night before and chose my five favourite Jockey Silks and did a skittle mani. I then put $20 on those horses in a boxed trifecta at the TAB and ended up winning the trifecta and bagging $1100. Naturally, I had to attempt my genius at picking the winning horses again this year. 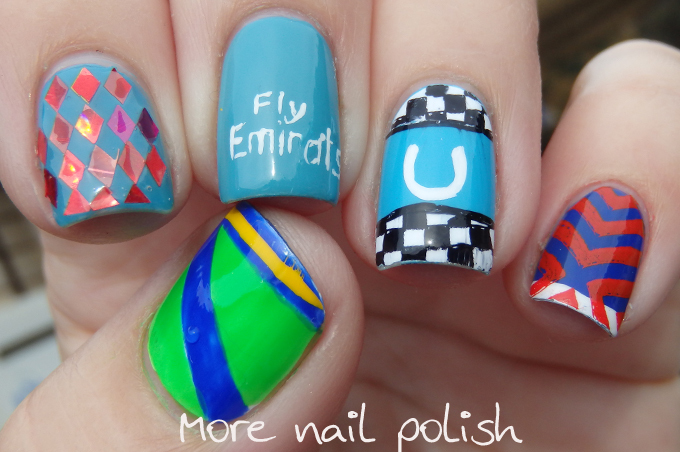 So last night I went through the race guide and picked out the designs I wanted to paint on my nails. As I was looking at the horse names I noticed one called 'Cavalryman'. Given my husband played baseball in the National comp for the Canberra Cavalry, I just had to pick that horse, but of course it had the boring plain blue top with the "Fly Emirates" writing on it. Cavalryman ended up getting scratched early this morning, so never even ran, but it turned out there was another horse from the same trainer, therefore with the same jockey silk (just with a white hat). So I ended up putting that horse into my trifecta. If I'd had more time before work I might have picked another jockey silk for that nail. Third place in the multi million dollar race went to 'Who shot the barman', and looking at his awesome silks below, I totally should have chosen it to paint on my nails. 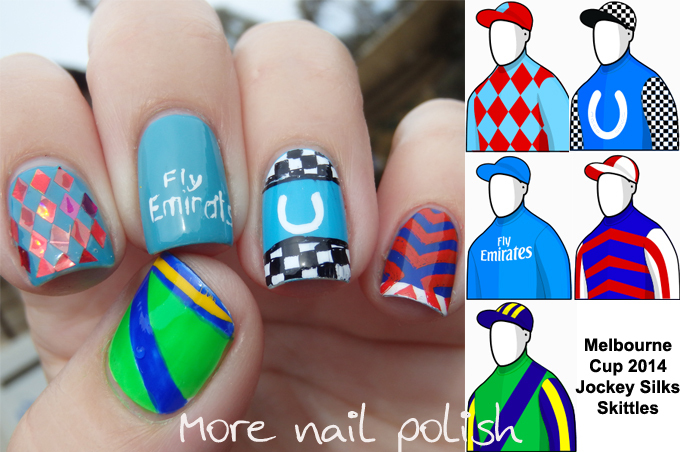 I'm already looking forward to doing my nails for next years Melbourne Cup. Were any of you other Aussies winners today? My boyfriend's brother picked Protectionist, so it was pretty exciting when he won (even though it was only a bet of $5). I chose Who Shot TheBarman, and had a $5 bet on him placing, so we both came out okay, haha! I love your interpretation of the jerseys. 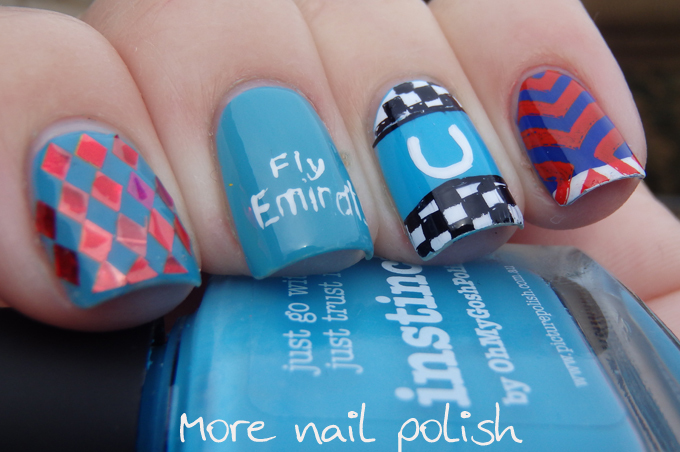 I painted my nails with some of the jockey's silks too - I actually did Who Shot Thebarman on one hand (it looked great!) and Admire Rakti on the other. It's pretty fun to paint your nails to match an occasion. Silver Holos - which is your favourtie?